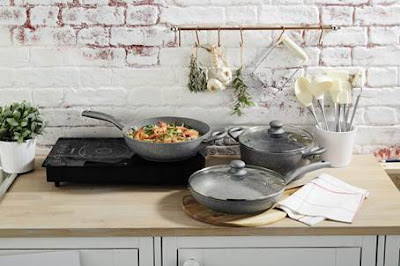 On Thursday 20th of October Aldi will be releasing their kitchen helpers range which includes on-trend Marble Effect Pans and Kitchen Accessories. The products will be sold in store and online while stocks last. Stay on trend with Aldi’s marble-effect cookware featuring large, medium and small pans (ranging from £6.99 to £12.99) as well as a Bread Bin (see below,£9.99) and Tea/Coffee/Sugar Canisters (£9.99). These attractive essentials are the ultimate style update for any kitchen. The range is released on the same day as the Aldi Christmas baking range so head to Aldi to get your bake on! and update your kitchen essentials in time for the festive period.